Something about traveling brings out the gold bug. 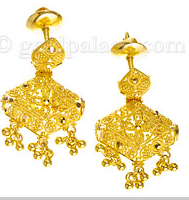 I just had lunch with my GF C., who wore ornate Indian earrings her husband brought back from a business trip to Mumbai. "I never thought I liked gold all that much, but now I do!" she chirped. I guessed the reason: C. had owned a few pieces in 14k; DH's gift was 22k. She was enchanted by her new earrings' deep glow. C. and DH are planning a Mediterranean cruise and she's hoping to buy more jewelry at ports. She asked for some pointers. The higher the karat, the higher the gold purity is in the piece. Sometimes they also stamp 18K on a 14K piece. In China, the literal translation of platinum is "white gold", which is confusing. The most popular all oys are, Europe: 18k and 14k; USA and Canada: 14k; UK and Australia:18k and 9k; India, Middle East and South East Asia and China: 22k. In Hong Kong you can buy 23.76k (almost pure gold), if you wish. Pure gold is always yellow but gold is rarely used in its pure form (24k) for jewelry because it is just too soft; it scratches and dents easily. If you are buying a ring with prong-set stone, the prongs may be 14k, which is harder, or platinum, far stronger than any gold alloy. The addition of other metals to gold creates the different karatages, colours and changes in hardness, strength and malleability. For example, yellow gold is created by alloying the gold with copper and silver; using copper only creates pink gold; white gold contains platinum or palladium, zinc and copper; green gold contains silver, copper and zinc. 2. Gram weight indicates how much the item weighs or how much gold was used in the piece. This is an important detail, since the higher the gram weight, the stronger the piece. Pay special attention to fasteners or clasps, making sure catches work easily and are secure. After losing one necklace, I now add a security chain or upgrade to a heavier clasp, which can often be done while you wait. Clasps are a typical place where vendors to tourists cut corners. The backs of pins and earring posts should be strong and firmly attached to the piece with no soldering marks visible. 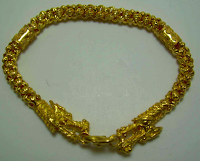 With gold chain, lay it flat and make sure the links don't kink or bend; broken gold chains are tricky to repair. There's no on-site test to ensure the karatage stamp on the piece is honest, or that the piece isn't plated, but in general, workmanship is a clue. If the clasp is flimsy, the edges rough, or the soldering is lumpy, walk away. The best "insurance" is to build your eye by visiting reputable jewelers before your trip. You could also carry an earring or ring whose karatage you know as a comparison- but this is not perfect as alloys are not the same even when karatage is. If you buy an item and leave it with the vendor for pick up later, check the contents before you leave. 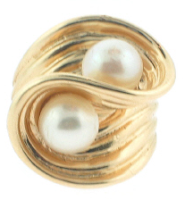 A friend visiting a pearl farm in China bought several strands with elegant 22k gold clasps, and found, back on the tour bus, that they had been swapped for far inferior goods. Fortunately, the tour operator was willing to send someone back to deal with the vendor. A friend was relieved that Visa paid for a replacement of the bracelet he bought for his DF when it broke shortly after he returned home. If you have Visa or AmEx cards, check with your bank for your card's purchase protection coverage for damage and theft. Many market vendors won't take cards, but most shipboard boutiques and many local shops will. If you pay with a card, make sure you keep both the shop and card receipts, and have the vendor record serial numbers or a thorough description of the item on both. Friends have returned from trips to the East saying "gold is so much cheaper there". Since gold is internationally priced, the material is not cheaper, but the workmanship is. If you live in a city with an ethnic neighbourhood that matches your destination, go to check prices. If that's not available, research on the net. Study styles and techniques too, so you'll appreciate fine craftsmanship and make better choices. I did this before going to India; though I didn't buy gold, I helped my travel companions. If you like antique jewelry, research prices before you go via online dealers. Don't be swayed by the atmospheric flea market, where I have seen shockingly overpriced pieces. Just because you are there does not make the piece a decent buy. 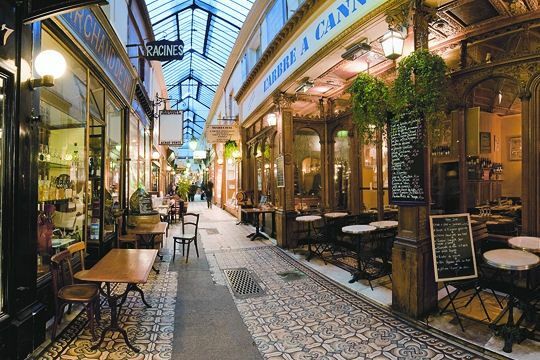 To find vendors at your destination, research before you go, ask a local contact to take you to a reputable vendor, or talk to the concierge at a five-star hotel. In Asia the amount of gold you are buying, indicated by weight, is the key factor in setting a price, unlike in the North America and Europe where the value of the gold itself is usually much less than half of retail price. Gold is also sold in Thailand by the bhat, one bhat=15.1 grams. If shopping in a place like the gold souk of Dubai (Deira), be prepared to haggle and know the international price for gold by the gram, which changes daily. If you pay in cash, you can save significantly on a bigger purchase. Beware of ports of call discount shops; it's easy to get buyer's fever, sinking into the shopping daze I call, "I'm here, it's here, I want it." Picture y ourself wearing the piece at home with your usual wardrobe. Thanks to online shops, a great deal of ethnic jewelry can be bought once you return, like this Egyptian cartouche, $315, from King Tut Shop. It's worth paying a small premium for shipping to save yourself from an impetously-chosen mistake. Ask yourself, is it really one of a kind? 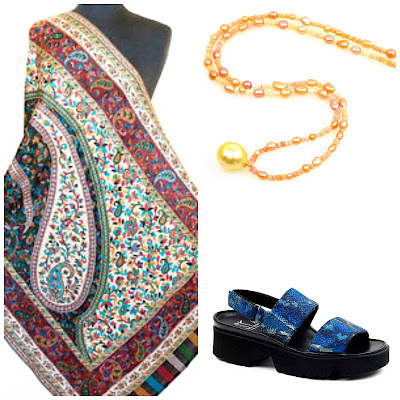 But whether in souk, shipboard or boutique, if the piece and price are right, indulge! Gold jewelry provides generations of delight. I like the textured studs, in white gold for me, please. At a certain age, texture is the key element. Although I´m somewhat interested in fine jewelry, I´m just an amateur and I only have a handful jewelry myself. Less is more. Abroad, I´d probably only visit the respectable jewelry shops. Thank you for the `tour´. I do love gold. While silver and platinum looks divine on some women, for me the warmth and "sunshine" quality of gold can't be beat. What a thorough, helpful post! What a great post. Thank you for the excellent explanation of karat weight and gold content. I have always been a yellow gold girl, even when white gold and platinum were in fashion. It just looks best with my skin tone. Here in Northern California we have large Chinese and Indian communities. That Indian jewelery, especially the wedding stuff, is just gorgeous. It would be a great way to prepare for a trip, as you have said, to browse locally first. I have wanted a pair of ruby chandelier earrings ever since I went to India in 1981.
metscan: I wore only white metals till my mid-40s, then I don't know what happened- but now wear both. The yellow has to be at least 18k on me,though. ma: Thanks, let's visit jewelers next time you're here! s: And when it gets that deep patina, ooooh. Belle: Though white comes in, does yellow ever go out? LPC: Rubies and gold- just gorgeous. And would go with your blanket plaid! Thank you for the info and research. Question to everyone: Beyond metal, is there a consistent design/theme in jewelry that you are constantly drawn to or is it an eclectic choice based on shopping venue, occasion for purchase or impulse. Do check what gold is selling for on the market--in grams. That way you know what you are buying for the gold vs. the workmanship. You can bargain on workmanship costs, but unlikely on base gold price. I have a 17 gram, 14k gold cuff custom made that I plan to wear should we ever become refugees... LOL The thing is so heavy it is not that comfortable. However, it is "worth its weight in gold!" Vesna: I've built a 'wardrobe' of basics (not boring though), and now add what Imogen calls "hero pieces' and look far more than buy. Looking helps me make better choices. In 20s, early 30s bought more on impulse. While I like many periods I am not drawn to conventional pieces( e.g., diamond engagement ring sets), or brands I see everywhere. spacegeek: Wow, nearly a quarter-pounder! I like that term "hero" pieces. I assume it's not all about price or size and if you ever feel in the mood would love some pics. What do you think of high end "craft/art" jewelry vs. fashion jewelry? I'll post some this fall, Vesna. I have some 'craft/art' jewelry- a resin bangle, pearl necklaces, silver earrings and rings. By "fashion' do you mean costume? I wear very little of it, mostly vintage- but on some women it looks wonderful. 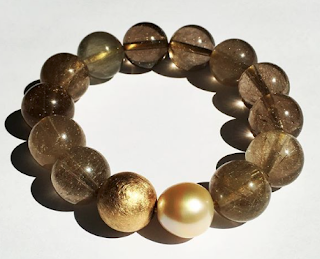 Fashion jewelry to me includes precious and non precious jewelry that is connected to the fashion industry and reflects social and entertainment media. Some examples of the high and low: Subversive Jewelry and the work of Solange-Aguzary Partridge. Vesna: The fashion industry is so broad, comprising both independant, relatively unknown designers and the big houses. Some of Aguzary-Partridge's pieces are stunning, others too young for me. Have admired Subversive but don't own and since I'm buying with an eye to wearing to 70 and beyond, not for me. That Jacob bling, fun but not me either. Ivanka Trump's line surprised me with its elegance. Sevan astonishes me. I'd appreciate you sharing any favorite designers. If I had a windfall I'd be looking at some serious pearls first, that's me. When I worked in a jewellery shop in the UK - white gold was made from yellow gold and then rhodium plated. More accurately, they achieved the look of white gold that way- or "whiter than white gold". White gold can be various shades, but is essentially grayish because of the alloy. Rhodium plating is used to make white gold (or yellow gold) 'super white', kind of like putting veneers over teeth. It's durable, but eventually wears down and if you want to keep that look, the ring must be replated. In heirloom white gold pieces, the piece was not plated, nor is white gold always plated with rhodium today. Once jewelers figured "it's going to be plated anyway" many stopped trying to get the whitest white gold as the alloy and just plate yellow or muddy white. I prefer the mellower look of real white gold, but for me platinum is king for white metal settings. Duchesse: For me it was the other way around; all my pieces of jewelry were either silver or yellow gold. Then suddenly I changed to white gold. I too prefer the mellower shades of white gold and my diamond ring now is in platinum. In the `color chart´I´m a summer and do like cooler colors. Silver jewelry is great for women of younger age ( I know this will annoy someone ) in my opinion. metscan: Silver is a far more casual look, and I think it's fine for any age but depends on skin tone. Maybe the thing is younger can carry off an inexpensive trinket but as you age, quality is more important? And there are varying qualities of silver jewelry. Nice post on "Buying jewelry: Gold on the road".